Add Control Voltage to where YOU want it! Have you ever wanted to add control voltage to a parameter on your synth or circuit bent toy? Now you can! The Vac Pak is a vactrol-based control voltage to variable resistance circuit. Connect your CV source to the input jack. Set the Scale and Offset trim pots to dial in your optimal resistance, with a range between ~300 ohms to ~10M (all vactrols are a little different in range). Connect the wires from J4 to your circuit to make a variable resistor. 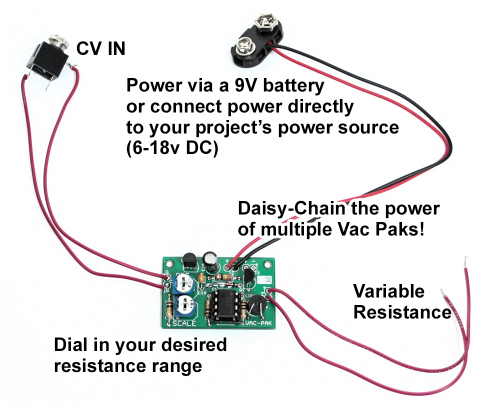 Daisy-chain multiple Vac Paks to the same power source using the remaining connector (either J2 OR J3). Power the Vac Pak with a 9V battery clip (wired to J2 or J3) or with your circuit’s on-board voltage source (wired to J2 or J3). An onboard 5V regulator allows the Vac Pak to be powered with 6-18V DC. Caution: Do not exceed +10V DC on the CV input, more may burn up your vactrol! Hi, I just received the kit and am interested in different things I could do with it. Is there any way to adapt this circuit to go the other way: convert a resistance like a potentiometer to a control voltage?